Written by Don Shenker, Project Manager for Healthy Ageing. At the first workshop day for care home managers on the Pioneer Leadership Programme last January, participants were asked to list the things they did in a typical day as a care home manager. The 14 managers listed 55 tasks they typically undertook on a daily basis – ranging from dealing with funerals, preparing the staff payroll, dealing with complaints, checking medication systems and helping to move beds. As someone who was very new to the care home sector, I was awed by the responsibility care home managers held and the loneliness of the job at hand – providing high levels of care to some of the most frail older people in society and dealing with the myriad regulations, controls and quality checks from CCGs, local authorities and the CQC. The managers on the programme nodded in recognition when talking about missed lunches, half-drunk cups of cold tea and waking up in the night, worried if everyone in their care home was alright. To add to this, CCGs are continuing to push their care homes to reduce the number of residents going into hospital unnecessarily and to accept new admissions to the care home even at weekends – all to ease the pressure on hospitals struggling to cope with acute demand from a frail older population. One in seven over 85’s now live in a care home and there are three times as many care home beds as there are in the NHS. To add to this pressure on the NHS, emergency admissions to hospital from care home have increased by 65% between in the last six years (2011-2017). 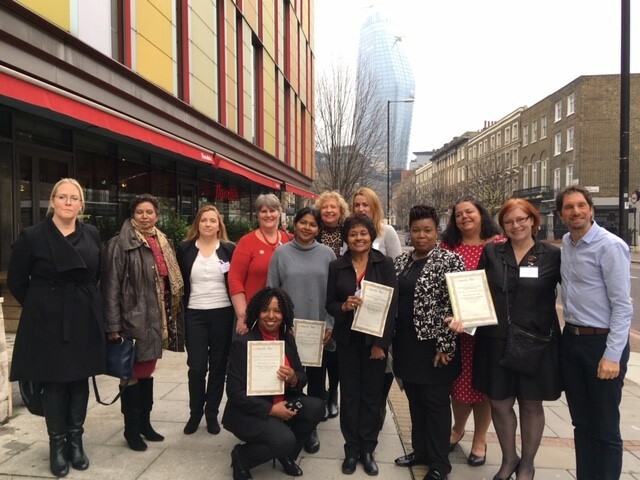 The Health Innovation Network and My Home Life Care Home Pioneer Programme is a free leadership course for south London care home managers which aims to develop the leadership skills and confidence needed to lead care home teams in a demanding and pressurised sector. The programme is run over nine months, with managers using exercises developed by My Home Life to improve deep listening skills, focus on collaboration, connect emotionally, discover what is working well and embed positive change together. The principle of appreciative enquiry is adopted – starting with recognising existing strengths as a team and building on that. The overriding sentiment managers spoke of, to a packed room of care home managers, CCG commissioners and local authority staff on their Graduation day, in November, was how the programme had helped to build the confidence they needed to make changes and improve their home. From changing how they ran team meetings to encourage staff to speak out, to developing culturally appropriate services and initiating new ways of involving residents in decision making, the care home ‘Pioneers’ spoke of how they had achieved a transformation in themselves and in their home. The programme evaluation shows a two-fold increase in the confidence managers felt in managing their team and their home. Having developed our original Pioneers in 2018, the HIN is now recruiting a new cohort of care home manager pioneers for our 2019 programme, with the Pioneer Graduates being trained to co-facilitate and mentor the new cohort. At a broader level for south London, the HIN hopes to support the care home Pioneers to now co-create the solutions required for older adult care with NHS, CCG and local authority colleagues to ensure continuing high-quality care pathways for older residents/patients. Having seen first-hand the remarkable resilience, strength and knowledge gained by the 14 Pioneers, I’m confident they will go on to achieve even greater things.